Crescent Island Conservancy is located in Lake Naivasha the second largest fresh lake in Kenya which is approximately 100 kilometers from Nairobi and a 2 hours drive away. Along the way you make a stop over at viewpoint to enjoy the views of the great Rift Valley Escapment. Once in Lake Naivasha we proceed to Elsamere Lodge, the original home of Joy adams of "Born Free" fame for high tea. 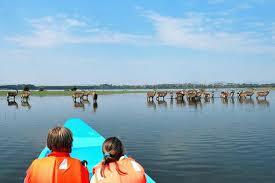 Elsamere Lodge or Camp is a haven for lover of Nature, set in Acacia forest on the banks of Lake Naivasha. It is the former home of the late Joy Adamson who together with her husband George Adamson, become the world famous for their pioneering conservation work and relationship with the lioness Esla, as told in her best selling book and subsequent film " orn Free"and she did much of her writing at Elsamere up until her murder in 1980. Her reletionship with Elsa the lioness who she raised from a young cub and a later successfully released back into the wild. After the visit, we proceed for lunch at one of the lodges located on the shores of Lake Naivasha. 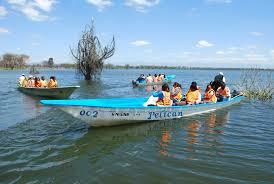 Early afternoon we take a boat ride of Lake Naivasha. This is a beautiful freshwater lake,, fringed by thick papyrus is almost 13kms across, but its waters are shallow with an averange depth of five metres.The waters of the lake draw a great range of gameto the shores. Our next discovery take us to Crescent Island Consevancy.The terrain is flat, making it easy for walkers of all abilities to enjoy themselves. There is a lot of easy to see games like Giraffes, waterbucks, Elands, wildbeests, Zebras and Impalas. Crescent Island was created in 1988, when Lake Naivasha dropped sufficiently to allow Crescent Island become part of the mainland. On the Eastern end of the island, sailing is possible at a private boating club.The terrain is flat, making it easy for walkers of all ability to enjoy themselves. It is also a heaven for birds with over 200 species. 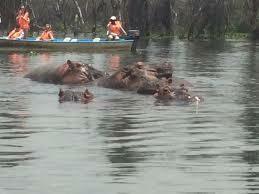 The lake has alot of hippos, which you can easily spot from the island. Among the resident birds are fish eagle, ospreys, lilly-trotters, blake crakes and variety of herons.Hippos live in the lake. A number of mammals can be seen grazing in the surrounding lake environs, such as zebras, impala, buffalo, giraffe, kongoni and at night hippos. A short boat trip from the mainland out into lake Naivasha gives you access to the unique crescent island wildlife santuary. Ther is also possibility to access it by road passing through the " Horse Riding Complex" A wide variety of wildlife birdlife and flora life lives quite freely out there and as there are no predators to be found, quite happily as well. Spend some time wandering around at your own pace and enjoy the peace and quiet broken only by the sounds of the islands wild inhabitants. At only two hours drive from Nairobi. 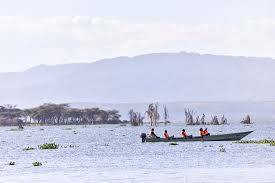 Lake Naivasha crescent island is a great place to forget the Nairobi urban life and do some sport activities such as hiking, walking, biking and game viewing and is a popular weekend retreat for the local communities. Crescent Island Game Santuary is safe because they protect te shores and `if you decide to pay them a visit, they gladly provide guides free of charge to show the guest around giving them information about the island and the animals.